It looks like NXNE is really stepping it up yet again this year. Last hear the big headliners were 80s throwbacks Devo and Men Without Hats, which was kind of cute – but really, not all that appealing outside of its novelty factor. I didn’t attend, choosing to see newer bands that were playing the festival that night instead. But this year, the big headlining band for the free Yonge/Dundas Square show on June 16th will be The Flaming Lips, which is fantastic. They have to be one of the best live bands I’ve ever seen, which is a necessity – considering they are competing with the best live band I’ve ever seen for an audience that night – Radiohead. For those who weren’t able to get tickets to Radiohead’s Downsview show, you now have a free and awesome alternative. It’s not quite as intense an experience as Thom Yorke and co., but it will definitely be a very memorable show. If you’ve never experienced the Flaming Lips live, I don’t want to spoil the magic for you, but animal costumes, confetti, puppets, dancing and walking over the audience in a big clear bubble are just the beginning – and that’s not even mentioning how great the actual music is. Yoshimi, The Soft Bulletin and Transmissions from the Satellite Heart are some of my absolute favorite records of the past two decades. I still wish Wayne Coyne was my best friend. 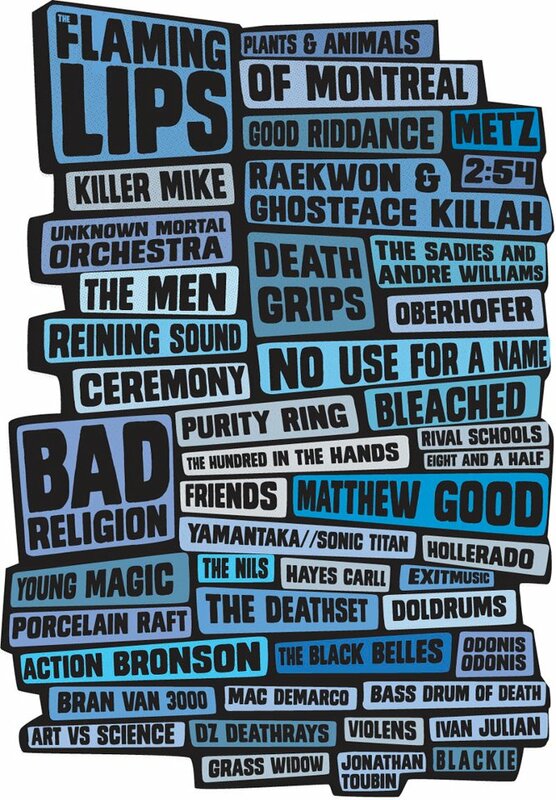 Other confirmed bands include Bad Religion, Raekwon & Ghostface Killah (of Wu-Tang Clan fame, haha), Matthew Good, Of Montreal, No Use For A Name, Purity Ring, Unknown Mortal Orchestra, Death Grips, The Men, Bleached, Good Riddance, METZ, Ceremony, Plants & Animals, The Death Set, The Sadies & Andre Williams, Oberhofer, Reigning Sound, Action Bronson, 2:54, Yamantaka/ /Sonic Titan, The Hundred in The Hands, Rival Schools, Killer Mike, Young Magic, Hayes Carll, Friends, Hollerado, Bran Van 3000, The Black Belles, Doldrums, Odonis Odonis, Mac DeMarco, Bass Drum of Death, Porcelain Raft, Exitmusic, Violens, Grass Widow, Eight and a Half, DZ Deathrays, Jonathan Toubin, Art vs. Science, B L A C K I E, The Nils and Ivan Julian. Anyone else surprised Bran Van 3000 are still together? I’ll admit the 12 year old in me is very much looking forward to singing along to But we did nothing, absolutely nothing that day, and I say: What the hell am I doing drinking in L.A. at 26? (kind of fun that this will happen when I’m actually 26). Oh and as if June 16th wasn’t already stacked enough for Toronto shows – Archers of Loaf will also be playing their reunion show at the Phoenix that night (limited NXNE passes will be accepted). The NXNE film lineup will include the world premiere of WHAT DID YOU EXPECT? THE ARCHERS OF LOAF LIVE AT CAT’S CRADLE, a feature-length documentary combining concert footage from The Archers of Loaf reunion tour with rare interviews of the band. I’m definitely looking forward to the band announcements that are still to come, as that will likely feature more of the local bands I love and will be recommending you to all go check out.